Two pairs of paintings by Johannes Vermeer are designated as pendants by Walter Liedtke in his catalog of Vermeer’s paintings. The canvases of one of these pairs have previously been shown to be from the same bolt, which is frequently an attribute of a pendant pair in seventeenth-century Dutch paintings. This paper provides evidence, in the form of a new weave match, that the second pendant pair identified by Walter Liedtke also exhibits this bolt-matestatus. In his catalog of the paintings of Johannes Vermeer, Walter Liedtke identified two pairs of paintings that may have been intended as pendant pairs,2 the Young Woman Standing at a Virginal paired with the Young Woman Seated at a Virginal, and The Geographer paired with The Astronomer. Both pairs are similarly sized, have similar subjects (two women and two scholars), and similar backgrounds. Further physical evidence that the paintings of the two young women were intended to be a pendant pair is provided by a detailed analysis of the canvas. The average thread counts are similar, and the pattern of stripes in the thread-density weave maps match strikingly.3 This is consistent with the two canvases having originally been on the same bolt, thus suggesting a physical proximity that may mirror the intended pairing of the two works. This paper continues the canvas examination by investigating the thread-density weave maps for The Astronomer and The Geographer. Again, the average thread counts and the patterns of stripes in the weave maps of the densities of the vertical threads are remarkably similar, establishing these two paintings as bolt mates. 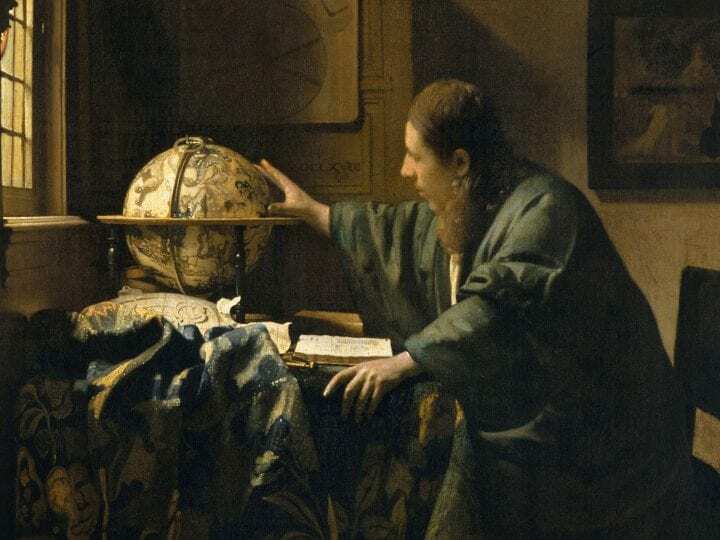 This further reinforces Liedtke’s claim that these two paintings were intended by Vermeer as a pendant pair. 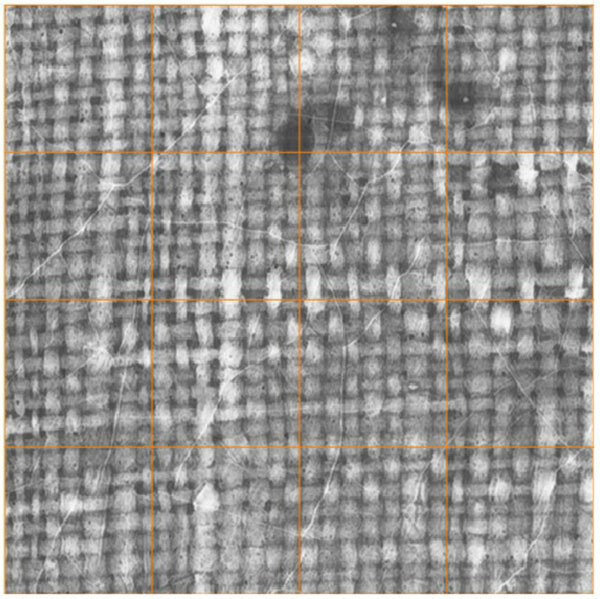 This claim was subsequently supported by a computer-generated weave density pattern match.7 Such observed similarities in the canvas weave density pattern frozen at the time of priming and ground layer application put the matching canvases in physical proximity at some point in their histories. Combining this with other forensic data and knowledge of an artist’s studio practice can offer insight into authenticity, dating, and even the artist’s intent, e.g., regarding pendant pairs. To imagine the appearance of a weave map, where the thread count within each small square evaluation tile is represented by an assigned color, consider the weaving process. The threads that run through the long dimension of the woven bolt of fabric are labeled the warp threads. These threads are wound around a beam and run tautly through the loom to be wound up on the cloth beam. In between, they are threaded through slits in the reed designed to help achieve a particular overall thread count (in threads/cm) across the width of the woven fabric. However, their placement and, thus the spacing between threads, has some flexibility so that each group of a few adjacent threads can have a modestly different number of threads/cm when measured across the width of the fabric. The weft threads, which are shuttled back and forth across the width of the fabric, are packed by the weaver with the closure of the beater bar that is parallel to the weft threads.8 For each crossing pass of a weft thread, the weaver raises and lowers different harnesses containing treadles through which the warp threads travel on their path through the reed. The treadles raise and lower different subsets of the warp threads to implement the interwoven nature of the fabric. Vermeer’s canvases exhibit a simple weave with a one-over, one-under pattern as the weft thread traverses the warp threads. The adjacent weft thread follows the one-over-one-under pattern but with the warp threads switched as to which one is above and which is below.9 While the straightness of the weft threads as they traverse the fabric is maintained by the beater bar, their local spacing depends on the force with which the weaver presses the beater bar against the already-woven portion of the fabric. Indeed, due to unavoidable variations in the force applied in pressing the beater bar against the already-woven fabric, the local density in threads/cm of the weft threads can be expected to vary more as one moves along the warp direction of the fabric than the local density of the warp threads varies as one moves along the weft direction of the fabric. Now, imagine a color-coded image of the thread counts in either thread direction. In many cases, the dominant feature is a collection of stripes running across the image in the direction of the threads being counted. Because such an exhaustive counting at all spots across a painting’s canvas was deemed infeasible to accomplish manually, the resulting stripes were never fully visualized in the painting canvas support analysis literature prior to the advent of automated thread counting. However, at the first public presentation of such a weave map,11 the audience reaction was one of immediate recognition that the striped pattern, which continues through the original bolt, could serve as a “fingerprint” for canvases cut from the same bolt of canvas. Fig. 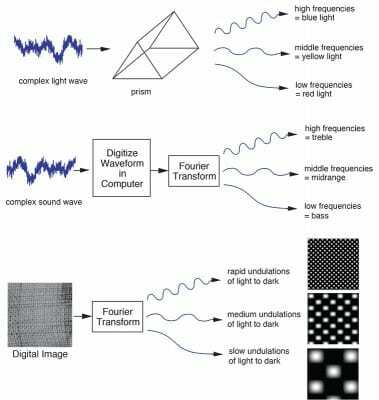 2 The Fourier transform decomposes an image into simpler periodic visual patterns in a manner analogous to its action on sound waves (decomposing into bass, midrange, and treble) and to the action of a prism decomposing light waves. Such manual thread counting is laborious and is only undertaken on selected locations across the surface of a canvas. Several techniques have been applied in order to automate the counting procedure, including the use of the Fourier transform,13 autocorrelation,14 and thread-level analysis.15 The Fourier method pursued here decomposes a signal (such as an image, a light wave, or a sound) into a collection of frequency bands. This can be understood by analogy with a prism, which takes a light wave and breaks it into low frequencies (red light), middle frequencies (green light), and high frequencies (blue light), as shown in fig. 2. The analogous operation on sound waves decomposes a complex sound into low frequencies (bass), middle frequencies (mid-range), and high frequencies (treble). In applications, the signal (image, light, or sound) is decomposed into many hundreds of bands, and each band is associated with a coefficient that quantifies the signal strength in that portion of the total signal. The largest of these coefficients is the principal component, and in the thread-counting application, the principal component in the frequency range of interest is intimately related to the thread count. To convert the similarity assessment into a visual task, the density values for each evaluation tile are transformed into colored squares at each evaluation spot. The resulting weave density maps for The Geographer and The Astronomer appear in fig. 3. The two maps shown indicate the densities of the vertical threads. The immediately obvious defining feature in each of the two maps is the pattern of stripes. The specific pattern revealed will depend on the size of the evaluation tiles. As this pattern is the result of the manufacturing process, it will be shared by bolt mates. Figure 3 has aligned the two weave maps, after rotating the bottom one of The Astronomer by 180◦. Due to the similarity of the subjects of The Geographer and The Astronomer (and the distinctness of these subjects from Vermeer’s other paintings), the apparent use of the same model, the similar sizes of the two paintings, and their accepted dating as having been created in the same time frame, no Vermeer expert will be too surprised to learn that these two paintings are on canvas from the same bolt. The matching weave density maps introduced here of the patterns of the local densities of their vertical threads support this conclusion. 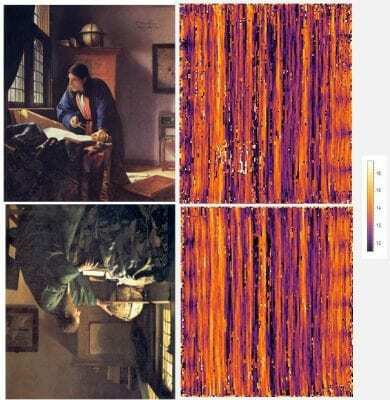 This fourth weave match discovered among Vermeer’s thirty-four paintings on canvas17 can be used to support the claim by Walter Liedtke that The Geographer and The Astronomer were intended by Vermeer as a pendant pair. C. Richard Johnson Jr. is the Geoffrey S. M. Hedrick Senior Professor of Engineering at Cornell University (Ithaca, N.Y.), the Jacobs Fellow in Computational Arts and Humanities at Cornell Tech (New York, N.Y.), a Scientific Researcher of the Rijksmuseum (Amsterdam), and Computational Art History Advisor to the RKD (The Hague). 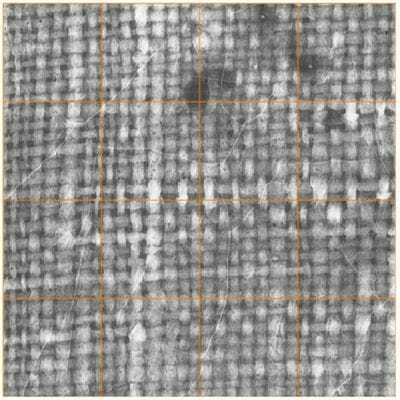 Professor Johnson’s research in the past decade on automated matching of manufactured patterns in art supports via canvas weave mapping, photographic paper texture classification, and laid paper mold mate identification has appeared in the Burlington Magazine, the Metropolitan Museum Journal, Studies in Conservation, the Journal of the American Institute for Conservation, Art Matters, and IEEE Signal Processing Magazine. Reprints and more can be found at http://people.ece.cornell.edu/johnson/. W. A. Sethares received a B.A. degree in mathematics from Brandeis University and M.S. and Ph.D. degrees in electrical engineering from Cornell University. He is currently a Professor in the Department of Electrical and Computer Engineering at the University of Wisconsin in Madison, and a Research Scientist in the Conservation Department at the Rijksmuseum in Amsterdam. Sethares is author of Tuning, Timbre, Spectrum, Scale (Berlin: Springer, 2004) and Rhythm and Transforms (Berlin: Springer, 2007). His current work on image processing is focused on applications in art history and conservation. The authors thank Blaise Ducos (Musée du Louvre), Elisabeth Ravaud (C2RMF), and Michel Menu (C2RMF) for providing access to the X-radiographs of the The Geographer and Jochen Sander (Städel Museum) and Stephan Knobloch (Städel Museum) for providing access to the x-radiographs of The Astronomer. The authors are indebted to Rob Erdmann (Rijksmuseum) for assembling the full painting composite X-radiographs of the two Vermeer paintings. Finally, the authors wish to acknowledge the enthusiastic support of Walter Liedtke in their years of study of the supports of Vermeer’s thirty-four paintings on canvas. 2. Walter Liedtke, Vermeer: The Complete Paintings (Antwerp: Ludion, 2008). 3. Walter Liedtke, C. Richard Johnson Jr., and Don H. Johnson, “Canvas Matches in Vermeer: A Case Study in the Computer Analysis of Fabric Supports,” Metropolitan Museum Journal 47 (2012):99–106. http://dx.doi.org/10.1086/67014. 4. Enst van de Wetering, “The Canvas Support,” chapter 5 in Rembrandt: The Painter at Work (Oakland: University of California Press, 2000). 5. See Appendix 1 in Nicola Costaras, “A Study of the Materials and Techniques of Johannes Vermeer,” in Vermeer Studies (Symposium Papers XXXIII), Studies in the History of Art 55 (Washington, D.C.: National Gallery of Art,1998), 165–66. http://www.jstor.org/stable/4262260. 6. Libby Sheldon and Nicola Costaras, “Johannes Vermeer’s ‘Young Woman Seated at a Virginal,’” Burlington Magazine 148, no. 1235 (February2006): 92. 9. See illustrations in Rutherford J. Gettens and George L. Stout, Painting Materials: A Short Encyclopedia (Mineola, N.Y.: Dover Publications, 1966), 228. 12. Ernst van de Wetering, “Canvas Research with Emil Bosshard, Remarks on Method,” Emil Bosshard, Paintings Conservator (1945–2006): Essays by Friends and Colleagues, ed. Maria de Peverelli, Marco Grassi, and Hans Christoph von Imhoff (Florence: Centro Di, 2009), 268. 16. van de Wetering, “The Canvas Support,” 96. Erdmann, Robert, C. Richard Johnson Jr., Mary Schafer, John Twilley, and Travis Sawyer. “Reuniting Poussin’s Bachanals Painted for Cardinal Richelieu through Quantitative Canvas Weave Analysis.” 41st Annual Meeting of American Institute for Conservation of Historic and Artistic Works, Indianapolis, May 2013. Gettens, Rutherford J., and George L. Stout. Painting Materials: A Short Encyclopedia. Mineola, N.Y.: Dover Publications, 1966. Johnson, C. Richard, Jr., Ella Hendriks, Petria Noble, and Michiel Franken. “Advances in Computer-Assisted Canvas Examination: Thread Counting Algorithms.” 37th Annual Meeting of American Institute for Conservation of Historic and Artistic Works, Los Angeles, May 2009. Johnson, Don H., Ella Hendriks, and C. Richard Johnson Jr. “Interpreting Canvas Weave Matches.” Art Matters 5 (2013): 53–61. Liedtke, Walter. Vermeer: The Complete Paintings. Antwerp: Ludion, 2008. Sheldon, Libby, and Nicola Costaras. “Johannes Vermeer’s ‘Young Woman Seated at a Virginal.’” Burlington Magazine 148, no. 1235 (2006): 89–97. Wetering, Ernst van de. Rembrandt: The Painter at Work. Oakland: University of California Press, 2000. Wetering, Ernst van de. “Canvas Research with Emil Bosshard, Remarks on Method.” In Emil Bosshard, Paintings Conservator (1945–2006): Essays by Friends and Colleagues, edited by Maria de Peverelli, Marco Grassi, and Hans Christoph von Imhoff, 257–70. Florence: Centro Di, 2009.